OMG, you guys. This Healthy Banana Coconut Cream Pie is EPIC. It’s been a long time in the making. I actually attempted a similar recipe last year and it didn’t quite turn out right. I am pleased to say that this healthy pie recipe came out awesome! This pie is vegan, gluten free, paleo and free of refined sugars. There are a few steps, but I promise it’s pretty easy. I am also including a video tutorial in the post for you. If videos are more your thing, you can follow my You Tube channel as well. If you wanted to make this nut free, you can always use a different crust recipe. Oat flour may work nicely as well. If anyone makes the crust with oat flour, please leave me a comment and let me know how it turned out. The banana mixture itself would also make an amazing topping over ice cream. Yum! I recorded a short video for this as well. For more videos, you can subscribe to my You Tube Channel. A dreamy creamy banana coconut cream pie. ZERO refined sugar, gluten free, vegan and paleo approved! Easy too. Preheat oven to 350. In a food processor , combine the almond flour, coconut oil, maple syrup and flax egg. Pulse until a dough forms. Transfer dough to a greased pie plate and press out crust. Bake for 10 minutes. In a medium saute pan , on low heat, add the bananas, maple syrup, coconut oil, vanilla extract and cinnamon. Saute for a minute and then cover and let the mixture simmer for another minute. Once the bananas look cooked down a bit, remove from heat and set aside. 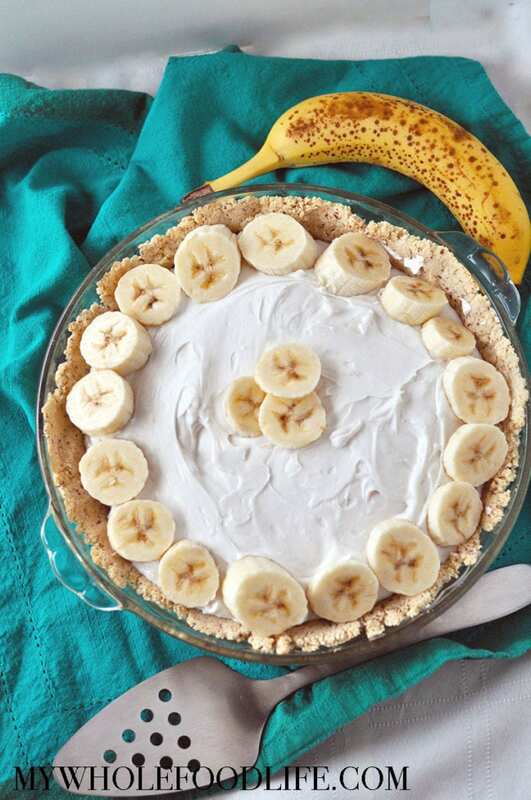 Once the pie crust is done, transfer the banana mixture into it and place in the fridge while you make the coconut cream. Open the 2 cans of coconut milk and scoop out the fatty white part. Place it in a mixing bowl with the other coconut cream ingredients. You can reserve the remaining water for smoothies. Using the whipping attachment on your mixer, whip into a cream. This may take several minutes on various speeds. Once a cream has formed, scoop it on top of the pie and spread out. Garnish the top with more sliced bananas and place in the fridge to set. About 1 hour. For optimal results, keep this pie stored in the fridge. It should last about 1 week that way. Enjoy! This was FABULOUS! I only had 1/2 the almond flour and crushed walnuts for the other 1/2 for the crust. SO delicious! Thank you Melissa! OMG! The sky is the limit. THANK you! Loved the ease of this recipe. For someone who loves making home-cooked meals and has little free time, this is truly the perfect desert. I noticed in the image you used spotted bananas. I did the same and find the taste of the banana to be a little sweeter making this desert absolutely delicious. Thank you for the post and I'm loving the site. You are so welcome Victoria! Thanks for the kind words. Would coconut flour be a good subistute for the almond flour? Would coconut cream on a can work for the recipe? I tried making this last night, but my coconut cream would not whip! I only used the thick part of the cream but it turned out lumpy and after close to 15 minutes it would not whip up. I was using my kitchen aid stand mixer so there was enough power to whip it. Hi Lori! So sorry that happened. :( What brand of coconut milk where you using?